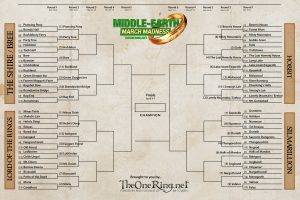 Middle-earth Map March Madness Round 2 update! Middle-earth Map March Round 2 is underway – and here’s how this round is unfolding thus far. No location has a lead in the 90% zone; the biggest leaders are all in the 80s. They are Bag End, leading against the Brandywine Bridge by 88% to 12%; Lothlorien thrashing Mount Doom with a lead of 84%; and Bree is proving to be no match against Hobbiton, only managing to secure 14% of the vote. Valinor is also cruising to another easy victory, currently leading by 83% to 17% against Nargothrond. It is of course the close battles which are most interesting. Right now the Misty Mountains are only 2% ahead of Beorn’s House, so that duel could go either way! Mirkwood is ahead of Lake-town, but by only 58% to 42% – so get over there and vote if you want to see Esgaroth turn that fight around. The margin between the Halls of Mandos and Angband is similar; Morgoth’s fortress is giving the home of elvish souls a run for its money, so far managing to claim 41% in the poll. Numenor likewise has 41% against Gondolin; if you’d like to see the men of the West pull out a victory against Turgon’s city, you’d better vote now! In the match-up which actually replicates an event from the books, Fangorn Forest has business with Isengard… And so far, the result is as you would expect: Fangorn leading with two thirds of the vote. Round 2 closes at 10pm EST tomorrow, Monday 25th. 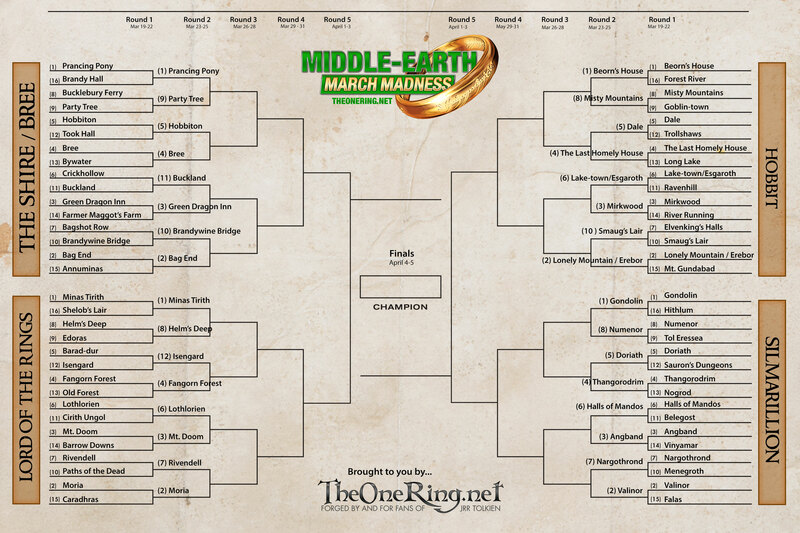 So don’t delay – only you can decide which locations go through to Round 3 of Middle-earth Map March Madness! VOTE NOW!